If, for example, you are processing a single colistin BMD strip you will require only the most basic of equipment. Broth microdilution can be performed on a single strip with a pipette and the requirements of any susceptibility test i.e. a McFarland standard to control the inoculum, a 100 uL pipette for dispensing the suspension and a 37C incubator. The results can be read by eye and recorded manually. We recommend an single channel electronic pipette for inoculating the wells, this will improve accuracy and reproducibilty. If you are processing a full microtitre tray for one or more organisms against a variety of antibiotics we recommend a more sophisticated approach. ​A multichannel electronic pipette becomes essential. Whilst reading results by eye is still a possibility we recommend using a photometer and associated software to read, record and interpret the results. With an electronic multichannel pipette 100 ul can be pipetted accurately into 96 wells in 10 seconds. ​ Both the Tecan Sunrise and Thermo Fisher Multiskan have been validated with the required Merlin MICRONAUT MC6 software. Both have the ability to read a plate in 7 seconds and allow you to connect to your LIMS and the computer where the MCN6 software is installed. 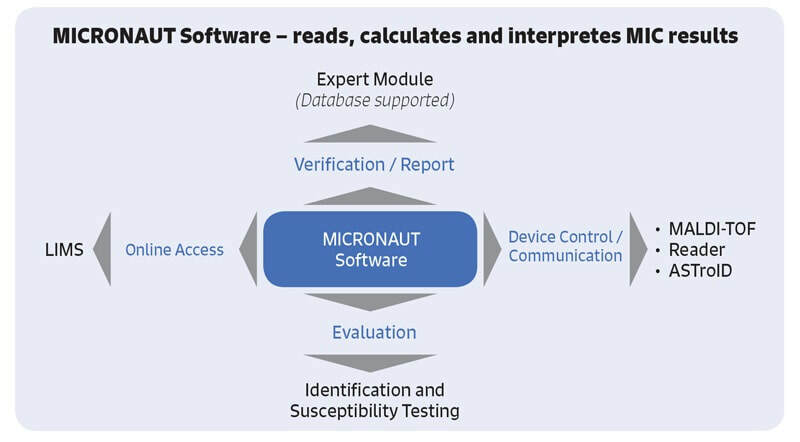 The MICRONAUT MCN6 software offers rapid standardized interpretation of the Multiskan or Sunrise readings in-line with current EUCAST guidelines and expert rules.